Do you work as an RD in ED treatment settings, or private practice? Have you ever struggled with keeping clients engaged during meal planning education, or are you feeling bored with the typical 24 hour recall??? Working with clients in eating disorder recovery on planning for meals, as well as tasks involving grocery shopping can be challenging! 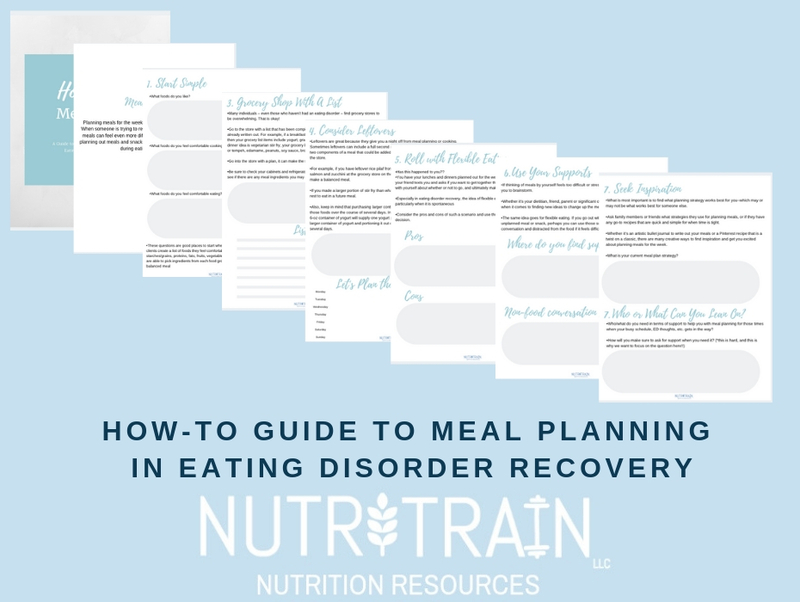 Dietitians can build rapport and trust with clients in recovery through providing them with thorough, and interactive options on how to personalize their meal planning experience. Self-Reflection/Self-Discovery included in workbook pages with questions for clients to work through either with RD guidance or on their own! Practice Note: *Walking through this guide 1:1 with a client takes between 60-90 minutes. This contains a downloadable PDF file. Product contains 9 total pages, which includes cover page, and intro page. LICENSE: You may not share, sell, or distribute the files. ©2019 NutriTrain, LLC. Nutrition Resources. NutriTrain, LLC retains all rights to the design and files. Product Terms and Conditions LICENSE: You may not share, sell, or distribute the files. ©2019 NutriTrain, LLC. Nutrition Resources. NutriTrain, LLC retains all rights to the design and files. NutriTrain, LLC Nutrition Resources is a collection curated to bring evidence based nutrition into the hands of the public through health promotion. The content created is from an RD for RD's to use in their private practice, clinics, college/university health center, fitness/movement studios, worksite wellness and within their communities. This shop contains carefully curated content developed for pediatric, adolescent, collegiate/young adult populations as well as nutrition through the lifestyle with a focus on intuitive eating, and intuitive movement. In addition, RDs will find worksheets, presentations and handouts focused on sports nutrition, eating disorders and food service in a school/university setting. If you are an RD2Be that is interested in working in the following settings (college/university, sports nutrition, food service, eating disorders, pediatrics), check out our resources and guides! Keep an eye out for new products added to this collection!